I admit that I am now over 60, but I cannot understand why restaurants and theaters are giving me the senior citizen discount without me even asking for it! It started innocently enough. My husband and I went to our local movie theater. It is our theater of choice and we go there almost exclusively to see movies. About a year ago I went up to pay the ticket and I noticed the discount. I was surprised. “Oh our discounts start at 55,” she answered sweetly. “Well that is okay then,” I responded. And happily walked off with an extra dollar. But that was then. Now it is different. The last two times when I went to my favorite bagel store, part of a big chain, I was stunned when I looked at my bill. The first time was in mid April. I took my children to lunch and was surprised to see ten percent removed from the bill. I showed it to my daughter. “Look, he gave me the senior citizen discount. Do you think I should tell him I am not a senior?” I asked my daughter. She looked down at me (she is 4 ½ inches taller). “Mom, you are a senior,” she responded. Really. I do not think so. A few days later I went back with my sister in law. Once again I was given the senior discount. This time I felt better. My sister in law is two years older than me. It was much more legitimate. But I was still shocked that it was just given to me without even asking. Okay I do have very grey hair. Some might even say that the hair that frames my face is white. But honestly, in the back it is quite black. And I really have no wrinkles. I guess I do not see myself as getting older. But it is obvious that some younger people see me in a different way. However, this week, I realized my husband and I get the senior citizen discount for a good reason. My husband and I love the chicken noodle soup at a local deli, D’Bronx. It has the all time best ever chicken noodle soup with a matzah ball. I love it. I have encouraged many people to become addicted to this soup. For months my husband and I ate there almost every Monday night after our ballroom dancing class. But a few months ago, our instructor left, and we stopped our lessons. So we stopped going out for soup every Monday. 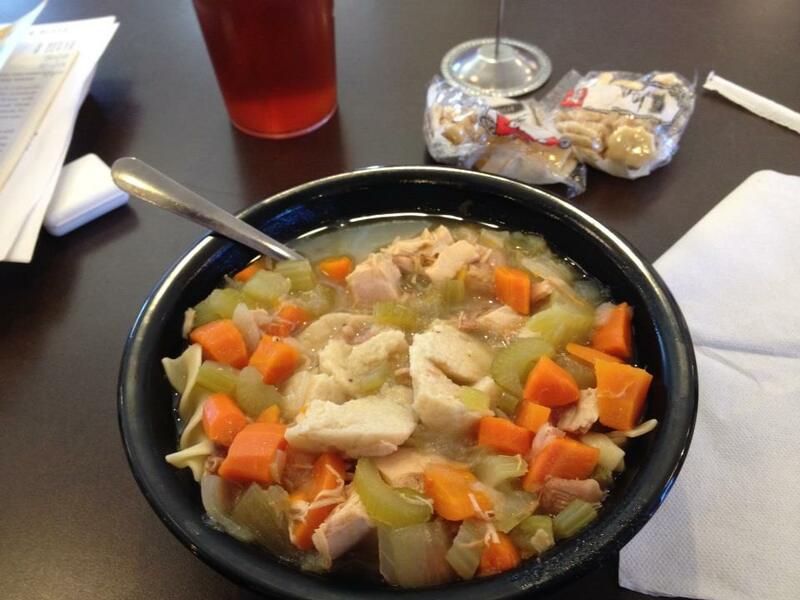 This past weekend we were bemoaning the fact that we missed our soup. So I announced that we would go out for dinner on Monday and have D’Bronx soup. It was planned! This is where the senior citizen part comes in. Monday evening came, and my husband arrived home from work. “What’s for dinner?” He asked. There was obviously nothing planned. “We are going out for soup,” I announced. Then we talked for a while about where we wanted to go. And ended up at a restaurant close to our house with a wonderful salad bar, but horrible chicken noodle soup. When I paid the bill, you go through a buffet and pay at the end, the young man gave me the senior citizen discount. Once again I bemoaned this discount to my husband. But I accepted my $2.34 discount. While we were eating dinner, I mentioned how much I did not like the soup. In fact I stopped eating it and threw my paper napkin into the bowl. It was that bland and yucky. We had a wonderful laugh. I will never bemoan the senior citizen discount again.